Hello and welcome to my new blog, set up to compliment my website and keep you updated on my recent activity. By way of introduction, I’m a London based photographer and filmmaker living in Willesden Green, with over 15 years of professional experience. My jobs consist of portraits, reportage assignments and events for editorial and commercial clients. It’s always been a priority for me to engage in personal work as well as commissions, photography which reflects my own interests. With a strong interest in environmental issues, I am currently focusing on Transition Towns. These are local networks that aim to inspire and support communities, in the switch from oil dependency in response to climate change. What does that mean? Well on a practical level events and activities take place which could all be considered to be promoting the environment. 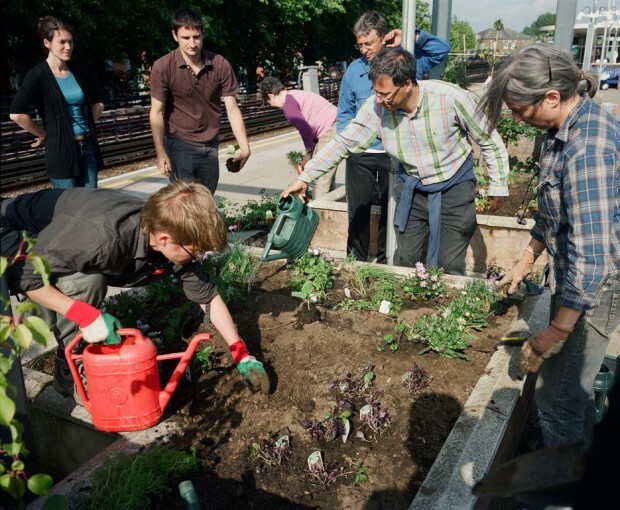 Food growing projects are a way of getting people involved in producing their own vegetables, and are a good example, particularly in public spaces, such as the raised beds on a tube platform.